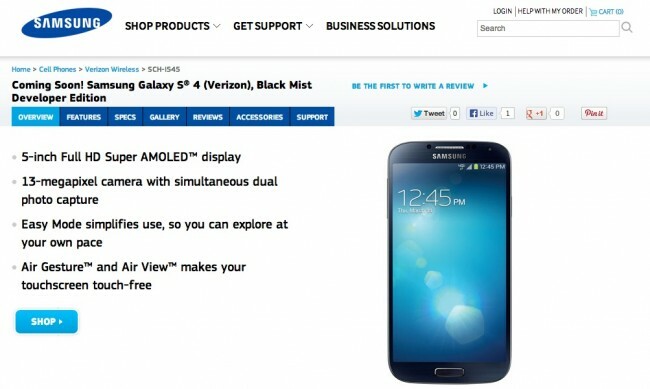 If you were at all disappointed to find out that the “Nexus experience” Samsung Galaxy S4 that was introduced at I/O with an unlockable bootloader, would only work on AT&T and T-Mobile networks, then maybe this news will brighten your mood. Posted to Samsung’s official online shop is a listing for the “Developer Edition” of Verizon’s version of the Galaxy S4 (AT&T version listed too). The current listing is of the Black Mist model, with 16GB of storage, and all of the other specs featured in this year’s Galaxy flagship. No price is given, but with Verizon asking $650 at full retail for their non-developer edition, I’d guess this will drop in at that same price. That also means that it likely won’t be available with a subsidy (discounted price). We should probably point out that this is not the same as the “Nexus experience” edition. This will not run stock Android out of the box and still should have all of Samsung’s TouchWiz skin atop Android 4.2.2. It will also be on the same update schedule as the regular Verizon version, meaning you won’t see updates any quicker, like you will with the “Nexus experience” version. For the hackers in the building, this once again is Samsung and Verizon’s attempt at giving you an option. If you want an unlockable bootloader, and a device that can be hacked to your heart’s desire, this would be the one to get. Well, it would have been had Dan Rosenberg not already cracked the bootloader on the regular retail version.